Our objective was to assess whether emergency suspensions of Postal Service facilities in the Eastern Area are executed in compliance with policies and procedures, including actions taken to reopen or discontinue facilities. 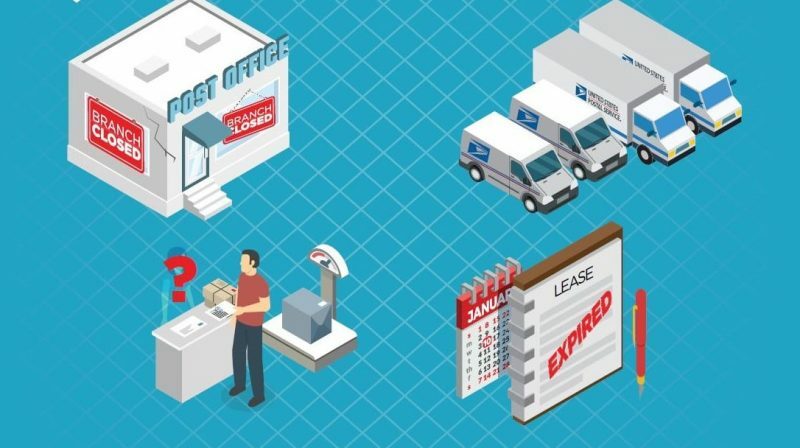 District managers may suspend the operations of any post office, classified station, or branch under its jurisdiction for the following reasons: a natural disaster; termination of a lease or rental agreement; lack of qualified personnel to operate the office; irreparable damage when no suitable alternate quarters are available in the community; severe damage to, or destruction of an office; challenge to the sanctity of the mail; and lack of adequate measures to safeguard the office or its revenue. As of March 31, 2018, there were 331 facilities nationwide in an emergency suspension status, with 94 (or 28 percent) facilities in the Eastern Area. Based on the Eastern area having the largest number of suspensions, we selected a statistical sample of 63 of the 94 suspensions. There have been facilities in the Eastern area suspended for up to 17 years. Eastern Area district personnel did not consistently comply with policies and procedures to ensure suspension decisions had an independent review, customers were appropriately notified, required approvals were obtained, or action plans were developed. Ninety-seven percent (61 of 63) of the facility suspensions, or 91 suspensions projected over the universe of 94, did not provide evidence that a suspension review team was established, to independently review the suspension decision. Forty-four percent (28 of 63) of the facility suspensions did not have evidence of district manager approval, or district manager approval was on the CSDC’s Notice of Post Office Emergency Suspension form after the facility was suspended. In eight of the 28 suspensions, districts approved the suspension between 3 and 33 months after its initiation. Thirty-seven percent (23 of 63) of the facility suspensions did not have evidence that affected customers were notified via individual letters, as required. 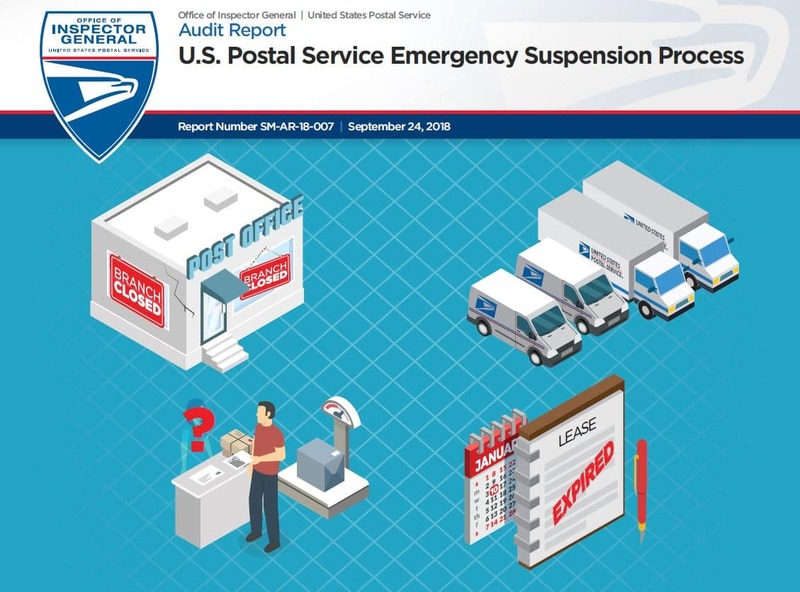 Fourteen percent (nine of 63) of the facility suspensions did not have a plan of action as part of the Notice of Post Office Emergency Suspension form, which is used to communicate suspension activities to headquarters. In addition, emergency suspensions are not adequately being monitored by area or district personnel for timely resolution of suspensions. Current suspension policies lack procedures for ensuring that suspensions are adequately monitored and managed effectively and efficiently. When policies and procedures are not comprehensive enough to ensure adequate monitoring, there is an increased risk that program goals and objectives will not be achieved. In addition, lack of monitoring could prolong the suspension process, leaving facilities suspended longer than necessary and potentially impacting the customer experience. We recommended management reinforce policy on the suspension process for district personnel who manage emergency suspensions through formal communications and refresher training; develop standard operating procedures, or enhance current guidance for the emergency suspension process to be more comprehensive in the areas of roles and responsibilities, deliverables, monitoring, and communication protocols; and take appropriate actions to address: (1) facilities stagnate in the discontinuance process, (2) facilities without alternate quarter searches conducted, and (3) the facility with an incorrect recording in the Change Suspension Discontinuance Center. This entry was posted in Downsizing USPS, General Union Business and tagged CSDC, discontinuance process, Eastern Area district, emergency suspension, facility suspensions, management failure, Notice of Post Office Emergency Suspension form, USPS OIG Audit Report. Bookmark the permalink.